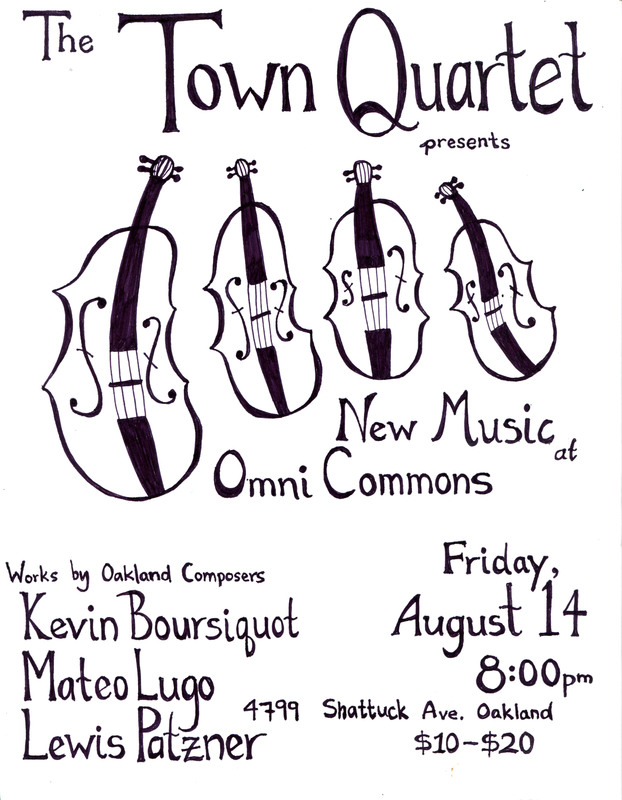 The Town Quartet is excited to present a program of all new music for string quartet by Oakland composers at the Omni Commons, Friday, August 14th. They will feature the music of Kevin Boursiquot, a recent transplant from SF, Venezuelan born Mills College grad, Mateo Lugo, and Oakland native and Town Quartet cellist, Lewis Patzner. The Omni Commons is a “space that fosters an ethic of radical collaboration across disciplines and between individual collectives, creating a living model for future radical spaces.” 8PM, $10-$20. 4799 Shattuck Ave, Oakland. I also want to say thanks to all of the generous patrons of the arts who donated to the Musical Art Quintet Kickstarter campaign. We met our goal! It’s awesome to know that people actually care about what we’re doing. Recording has been fun and productive, and I can’t wait to finish and share it you, the world. We have some upcoming shows, so check out our website at musicalartquintet.com. Thank you Thank you Thank you!